Decisions, decisions. This week has been, hard. But there is nothing like seeing the countertops and faucets go in and seeing your hard work come to life in design. This retro black and white black has been a favorite of mine for a couple of years. I had planned to update our upstairs bathroom with this look but once we uncovered the rotted wood floor...it became a whole other story. I debated and debated over the wallpaper. It's so tough! It's an investment and it sticks around for a while. There were so many good designs out there I'll have to share a round up of my favorite wallpaper soon. I kept coming back to this whimsical wallpaper that's in my favorite hotel in NYC, and I decided to go with my gut. If anything it can always remind me of one of my favorite cities. And it's pretty versatile. Spotted in bathrooms from Jesse Parris Lamb to Pencil and Paper Co. Love them both. Because of it's a whimsical look, it can come off a little bit kiddy, but I love how these designers added some fresh, sophisticated accents. For the floor, I partnered with an amazing online tile company called The Builder Depot. 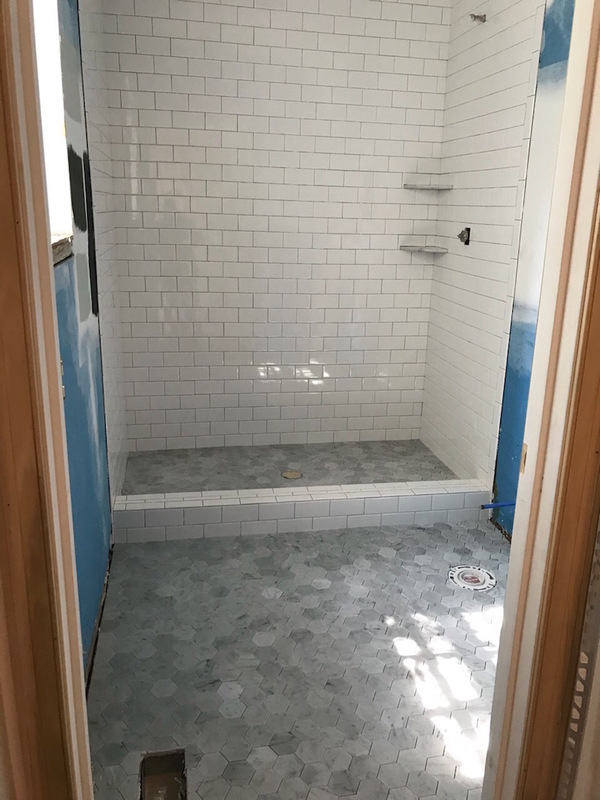 Buying tile online can be really scary even if you order a sample, you're not sure what you may get in the full order. What I liked about The Builder Depot (besides supporting a local Atlanta Company) is that they take a lot of pride in their work and make an effort to look at the pieces as a whole order. I picked the Carrara Bianco Honed 3" Hex, and I am so happy with it! It's even more beautiful in person. Here's a look at the full floor. And now for the design plan! The wallpaper goes in tomorrow, I CANNOT WAIT! !